Hey guys, before I write a little ditty on this I want to preempt it with a message. If you have a chance, any chance at all get by Second Alarm and have a beer. Be sure to tell Gary Harris your a Roanoke City Firefighter. Not to get a free drink, but to show him your solidarity to his passion he has enjoyed for 30 years. The Second Alarm is closing its doors after 30 years. The Second Alarm sits at 2816 Williamson Road. The same place it has been for 30 years. Gary Harris has owned and operated it ever since he opened it in 1979. Gary retired from the Roanoke Fire Department as a Captain after 35 years of service. He was hired on February 16, 1964 and retired in 1999. 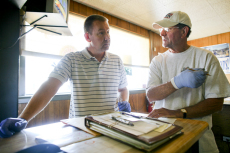 Sam Dean | The Roanoke Times 9/11/09--Todd Harris, left, and his farther Gary Harris discuss the items the plan on keeping after the sale of Second Alarm, a bar and restaurant the family has run for 30 years on Williamson Road. Gary’s son Todd is a firefighter for the Roanoke Fire-EMS Department and was hired in 1987. I currently work with Todd at Station 13 C-shift. I can tell you that just about anytime I drive by Second Alarm in the morning, both Todd and his father’s vehicles are there. They usually got together and cleaned and got everything ready for the days business. Second Alarm is open from 2pm til 2am. Today, when talking to Todd I could tell that the sudden events leading up to the announcement of closure had effected the family. I can only imagine that after 30 years, Gary would have liked to have had a different ending to the story. Needless to say that after 30 years of leasing the property, it isn’t much to ask of the owners. Unfortunately, Harris was not left many other options and the bar will be closing. September 26th will be the last day of the Second Alarm…unless Gary decides other plans at a different location. Like I said in the beginning, it would be great for everyone to stop by and say hello to Gary before it closes. Enjoy a frosty beverage and talk about “Back in the Day”. You might even catch Todd there! If you need a drinking buddy….give me a call!